Sonic the Hedgehog was such a popular video game hero in the 1990s that when a new protein whose mutation created spiny backs in fruit flies was discovered in 1993 it was named after him. The original Sonic Hedgehog video game may have gone the way of the eight-track audio cassette or the five-and-a-quarter-inch floppy disk, but the Sonic hedgehog protein has only just begun its rise to fame. In the 1990s Sonic the Hedgehog, a popular video game hero, gave his name to a protein now known to control the size and shape of brain structures during early development. A team of scientists led by chemical engineer David Schaffer has identified the Sonic hedgehog protein as a critical "cell fate switch" that can cause the normally small number of adult neural stem cells in the hippocampus of the brain to proliferate. This discovery holds important therapeutic implications for future treatments of brain damage suffered as a result of Alzheimer's, Parkinson's, and Huntington's diseases, strokes, or head traumas. "We have shown that the Sonic hedgehog network of proteins regulates the proliferation of adult hippocampal neural stem cells both in vitro and in vivo," says Schaffer. "In studies with rats, increasing the presence of Sonic hedgehog proteins in the hippocampus resulted in a 3.3-fold increase in neural stem cell divisions." Schaffer holds appointments with the new Synthetic Biology Department in Berkeley Lab's Physical Biosciences Division, UC Berkeley's Chemical Engineering Department, and the Helen Wills Neuroscience Institute. 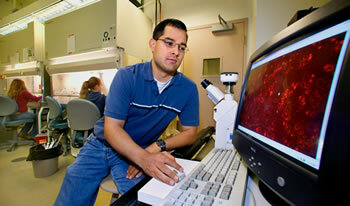 His scientific focus has been on the use of molecular and cellular engineering technology to treat biomedical problems. Prior to coming to UC Berkeley five years ago, he did a postdoctoral fellowship in the laboratory of Fred Gage at the Salk Institute for Biological Studies in La Jolla, where he began his investigations into the Sonic hedgehog protein network. Most of the cells in the human body are specialists assigned to a specific organ or type of tissue, such as the neuronal cells that wire the brain and central nervous system. Stem cells are different. When they divide, they can produce either more stem cells, or they can serve as progenitors that differentiate into specialized cells as they mature. Hence the name, because specialist cells can "stem" from them. The potential to differentiate into specialist cells whose populations in the body have become critically depleted as the result of illness or injury is what makes stem cells so potentially valuable to medical research. The idea is that if the fate of a batch of stem cells could be directed down specific pathways, they could be grown, harvested, and then transplanted into a problem area. If all went according to plan, these new cells would overcome damaged or diseased cells, leading to healing and recovery. "The life of a stem cell can be viewed as a hierarchical branching process, where the cell is faced with a series of fate switches," Schaffer says. "Our goal is to identify the cell fate switches, and then provide stem cells with the proper signals to guide them down a particular developmental trajectory." To date, most of the research  and just about all of the publicity  about stem cell research has focused on those stem cells found in four-day old human embryos, or blastocysts. These embryonic stem cells are prized for medical research because they have the potential to become just about any type of specialized cell in the body. However there are, in some types of tissue, pockets of adult stem cells that have the potential to differentiate into the cells that make up their host tissue. For example, adult neural stem cells residing in the hippocampus and a region of the forebrain called the subventricular zone (SVZ) can generate new neurons. Working with these adult stem cells offers some advantages over embryonic stem cells, as Schaffer explains. "First, adult stem cells don't present the ethical dilemma that embryonic stem cells do, because harvesting them does not destroy the donor. Also, they have already made some choices towards differentiating along a specific developmental pathway, so that makes the job of directing their future choices down that same pathway a little easier." In the case of the adult neural stem cells that Schaffer and his colleagues work with, the developmental pathways include quiescence, death, self-renewal, and differentiation down a number of neuronal lineages. Normally adult neural stem cells are present only in minute quantities, and most of these choose to remain quiescent. The first hurdle is to get the cells to proliferate. Chemical engineer David Schaffer identified the Sonic hedgehog protein as a cell fate switch that can cause neural stem cells in adult rats to proliferate. "Adult neural stem cells don't seem to exist for the purpose of replacing damaged neurons, but we believe that by identifying and learning to manipulate the signals that control their proliferation and differentiation we can use them for that purpose," Schaffer says. Toward this end he and his colleagues have taken both theoretical and computational approaches to unmasking the regulatory elements in adult neural stem cells. In their modeling work, they focused their investigations on a few prime suspects, such as the Sonic hedgehog protein. This soluble signaling protein was known to play a critical role in controlling the proliferation of numerous mammalian cell populations during early development, but little was known about its role in the adult stage. To determine the role of the Sonic hedgehog protein in adult mammals, Schaffer and his colleagues harvested neural stem cells from rats, then cultured these cells with Sonic hedgehog protein. Their success in boosting the proliferation of neural stem cells in vitro led to in vivo experiments with adult rats. The Sonic hedgehog gene was delivered to the hippocampus of each experimental animal through a special virus, called an adeno-associated viral vector. This genetic engineering resulted in the observed tripling of neural stem cells. In addition, injecting cyclopamine, a known pharmacological inhibitor of the Sonic hedgehog gene, significantly reduced neural stem cell proliferation in test rats. "The next step is to identify signaling proteins that regulate differentiation in neural stem cells," says Schaffer. "We'd also like to know more about the mechanism by which the Sonic hedgehog network of proteins is regulating stem cell proliferation. Cells are exposed to a lot of different regulatory signals, which they must correctly interpret to carry out functional decisions. We'd like to know more about how this information processing system works." 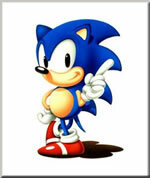 In culture, the number of adult neural stem cells triples in the presence of the Sonic hedgehog protein. 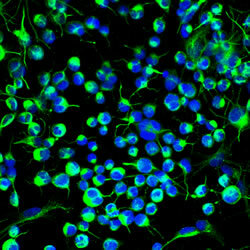 The cells stained green in this image are on their way to becoming neurons. A major challenge to the potential therapeutic value of adult stem cells has been that these cells exist in small numbers that only decrease with age. Discovering cell fate switches that can substantially boost neural stem cell populations represents a big step forward. However, Schaffer is quick to caution that it may be another 10 to 20 years before adult neural stem cells play any significant role in therapy. "With these neural stem cells, I think we're now at the stage that research with monoclonal antibodies was in the 1980s," he says. "However, if we continue to make progress, the potential implications for medical research are enormous." Collaborating with Schaffer on this research were Karen Lai and Matthew Robertson, who are both with UCB's Chemical Engineering Department and the Helen Wills Neuroscience Institute.